Jenny Lind’s great charity and generosity is one of the most noble traits in her remarkable career. In her native land she insisted upon devoting practically all of the receipts of her concerts to the support of the unfortunate. She insisted that she had been a “child of the State” and that it was her duty to further the cause of the education of unfortunate children in the country of her birth. “My most ardent wish is to be allowed to be of some lasting use to native art. To offer some kind of souvenir, more permanent than the quickly passing moments of my appearances on the boards; and to prepare for my countrymen enjoyments of the loftier kind for the years to come, when my own efforts shall have ceased. I hope to do this by laying the foundation of a college where young minds may be consecrated to both art and virtue. “Having been myself, in childhood, a witness of the privations and trials through which the young and needy have to struggle in this profession, which holds so many thorns amongst the roses, I should count it the most beautiful gain of the singer’s gift if, by means of this, I could contribute to help those who are favored by nature, but ill-treated by fortune to a development of their talent in comparative be devoted to an institution for educating poor children who, while especially endowed for the stage, lack the care of parents or relatives, without which, in a moral and artistic respect, they either lose or else fail to reach the higher development for which their gifts would give reasonable hopes. Hans Christian Andersen, the Scandinavian author and writer of fairy tales, tells the following story of a poor poet whom he found on the streets of Berlin and took into his home. After Andersen had provided for the material needs of the unfortunate man he sought to encourage him by giving him a ticket for Jenny Lind’s concert. While this is an excellent indication of Jenny Lind’s power over her auditors, the spectacle of a Roman soldier in tears must have been very amusing, and we can hardly blame the management of the opera house. Modern teachers would doubtless gradually increase the tempo of the exercise with the use of the metronome. Starting with the interval of the fifth and with the accent upon the upper note of the trill, and then gradually diminishing the interval, the trill may be developed in such a manner that all suggestion of the tremolo is avoided. 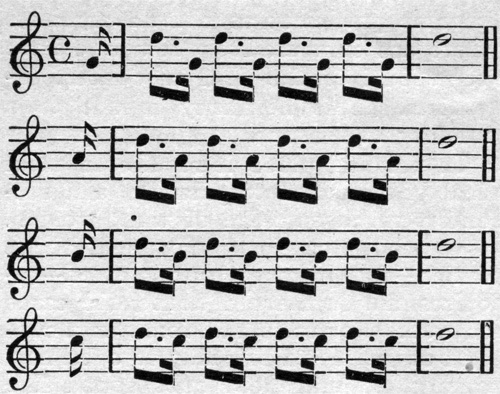 The difficulty in intonation in the trill is in striking the upper note on the right pitch. When the trill is sung the accent generally falls upon the lower or principal note, but when the above exercise has been faithfully practiced it is an easy manner to sing the trill with the accent in the proper place. You are reading Lessons From the Life of Jenny Lind. from the July, 1909 issue of The Etude Magazine.